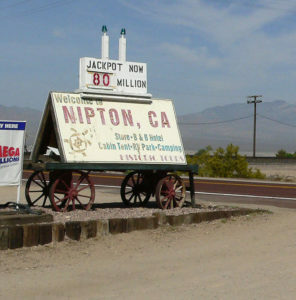 On Thursday, Arizona-based American Green bought the Mojave Desert town of Nipton for a reported price tag of $5 million. Nipton, a town of 120 acres, has about 20 residents, a hotel, a general store and a schoolhouse. It is located along Nevada State Route 164 about a one hour drive away from Las Vegas. American Green released a statement saying it plans to transform the town into the United States’ “first energy-independent, cannabis friendly hospitality destination.” The company says it will focus on bottling cannabis-infused water in Nipton. Likewise, it will prioritize the production of marijuana edibles and the cultivation of cannabis in the California town. The company also plans to build mineral baths, lodging, pot retail outlets and a “first-of-its-kind eco-tourism experience for conscious cannabis consumers.” American Green’s project of developing Nipton has a $2.5 million budget and an 18-month time frame. Nipton’s roots relate to gold and silver mining. The town was founded in the early 20th Century following a nearby gold discovery. The people who bought this will be fast millionaires. They can put a bunch of solar out in that desert on top of their greenhouses or whatever and grow marijuana for various uses. Edibles are quite popular. They will start a whole economy out there and make $$$$$. At least they aren’t stealing from the taxpayer. People willingly pay for the stuff. Watch out Paso Tourist board!! In time, marijuana may be a bigger tourist attraction than wine. May want to think about branching out? Potheads to the rescue! Town? Using the term in the loosest fashion possible. For the pot industry, the town of Harmony would have been a better for their flag ship. For California, this funding source to remedy bad governance should be called “The Brown Act”. I love it George! I didn’t think about it in that context, so…. Hey Gov’! Come on over and we’ll burn one (or two) and see if we can’t figure out a way to make California Great Again!